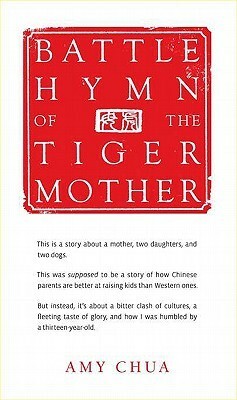 I first came across Battle Hymn of the Tiger Mother one summer month in 2011 as an audio book excerpt I downloaded for free from Random House Audio. That time, I was still into running races in the wee hours of the morning, and unlike people who have lively, upbeat music in their running playlist, I had podcasts and audiobooks to get me through. Anyway, imagine hearing about a mother who considers placing second a mediocrity, among other grueling expectations of achievement from a child, all while trying — the operative word — to make it alive after running 10 kilometers. From then on, I stayed away from the book because I thought it’s going to be preachy and self-righteous and smug. A week ago, I read it from the beginning, and did not feel that way at all. Sure, it was smug in some places, and I can only be thankful that she is not my mother, but the entire book, if anything, is an entertaining narration from the point of view of perhaps a neurotic mother — and if I can ascribe all the positives in neurosis, I will do it for Ms. Chua. Anyway, of course, it’s not a concrete depiction of how Chinese (or Asians) and Western parents typically rear their children but if you take it as a simple story of how a Western-bred Chinese mother parented her children (and dogs), you will realize it’s a good read. I don’t think Ms. Chua wanted to tell everyone this is how to raise excellent children; she told her story, and whatever you want to take from it, go ahead. What made it more bearable for me is that her efforts were not met without struggle. In fact, in most chapters, you will see how her daughters Sophia and Lulu (most especially) threw temper tantrums, defied her wishes, and talked back…well, before doing what she wanted them to do. In some cases she let the daughters “win”, but even if it’s so, it’s hard for her to have something done in one go. One thing I took from this, which is also available in many books about achieving excellence, is the importance of practice. One may be born with talent, but it won’t suffice if it’s not honed regularly. After this, I will look for videos of Sophia playing the piano and Lulu, the violin, in many prestigious concert halls, just to see what they turned into. The author said the book underwent plenty of revisions since she had her husband, author Jed Rubenfeld, and daughters read her drafts. So as a family effort, they agreed that even with the kind of extreme parenting she subjected her family to, the bond of mother and daughter is something to be reckoned with. She mentioned that even her husband found it odd how at one moment she and her daughter Lulu would appear like they want to kill each other over violin practice, then the next cuddle with each other bed and laugh over funny stories. I liked that the author admitted to getting hurt whenever she hears a biting remark, but taking it in stride because minding it will make them lose their focus. The author even said, “My goal as a parent is to prepare you for the future, not to make you like me.” Pretty heartless, but what can we do? To each his own. In reality, there are moments when, mainly because of generation gap, we cannot comprehend where our mothers are coming from. However, down the line, we still love our mothers very much. This is just like it, only peppered with the author’s extreme preference to succeed in whatever her daughters choose to do. In the end, the author probably wanted to convey that parents only want the best for their children, and even when it appears children do it because the parents want it, ultimately, it’s really for them. In this case, the author did it in her own — if I may say — hilarious, trainwreck kind of way, but often with great results. As a reader, I took pleasure from reading about their lives. Beats watching any reality show we have today.